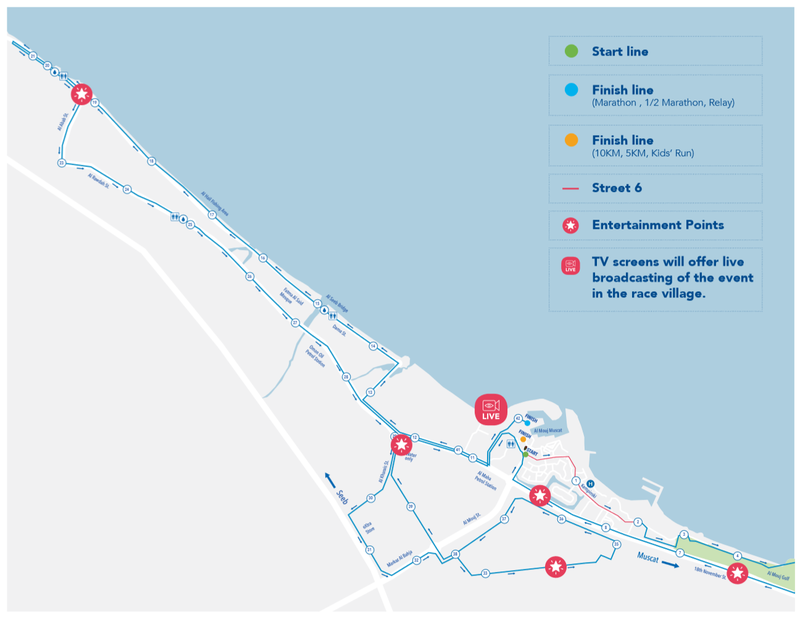 The 2019 edition of Al Mouj Muscat Marathon will be a two-day festival in Oman’s vibrant capital, on 18th-19th January. We’re looking forward to welcoming you to Oman’s most iconic sporting event as you show your support to the competitors from 51 different nations who will be running the course in 2019! For the best view of the races, our recommendation is to be at the start line, finish lines or along Street 6. Spectators are also invited to place themselves right at the heart of the action at different points along the course. There will also be several entertainment points on the route which will feature traditional bands, drummers and DJs. Motivation matters on the marathon route and this is your opportunity to provide support to your friends and family at key moments along their incredible journey. Please note that no vehicles, motorbikes, bicycles or pedestrians are allowed on the course. Race Day is also your opportunity to win big! An entertainment zone will offer games, music and plenty of family fun – including a unique shopping experience featuring local SMEs – from early morning on each of the two race days. OPENING TIMES: 5.30 AM to 1.00 PM on Friday 18th & Saturday 19th January 2019. The start and finish-lines for race categories will be situated at Al Mouj Muscat, Oman’s premier leisure destination and title sponsor of the event. From 6.00am to 12.30pm the following streets will be closed: 18th November Street / Dama Street / Al Rawdah Street / Al Karhais Street / Hail al Shumaliyya Street / Al Mouj Street. If you arrive from Al Seeb and wish to travel to Muscat you will be diverted onto the Highway. If you arrive from Muscat and wish to travel to Al Seeb you will be diverted onto the Highway. From 6.50am to 10am, 18th November Street will be closed: cars will be diverted onto the Highway. Runners are required to bring their QR Code confirmation email with bib number & photo ID for verification. Please present your QR Code email, either printed or on your smartphone so that it can be scanned. All participants will receive a bib and technical t-shirt during race pack collection. Members of our team will be available on all three days at this compulsory registration, to explain the route and answer any additional questions. If you are competing in the Marathon Relay, please note that team captains will collect Race Packs for ALL runners in their team. There is no requirement for you to attend race pack collection if you are not a team captain. International competitors are strongly encouraged to arrive in Muscat by the 17th January 2019 to collect their bibs on the final day of Race Pack Collection. Those facing exceptional circumstances who require later race pack collection, are requested to email info@muscatmarathon.om, stating their flight details and specifying the exact date and time that they can pick up their race kit. Catering for competitors and their supporters, the Race Village will feature free entertainment for the whole family to enjoy. 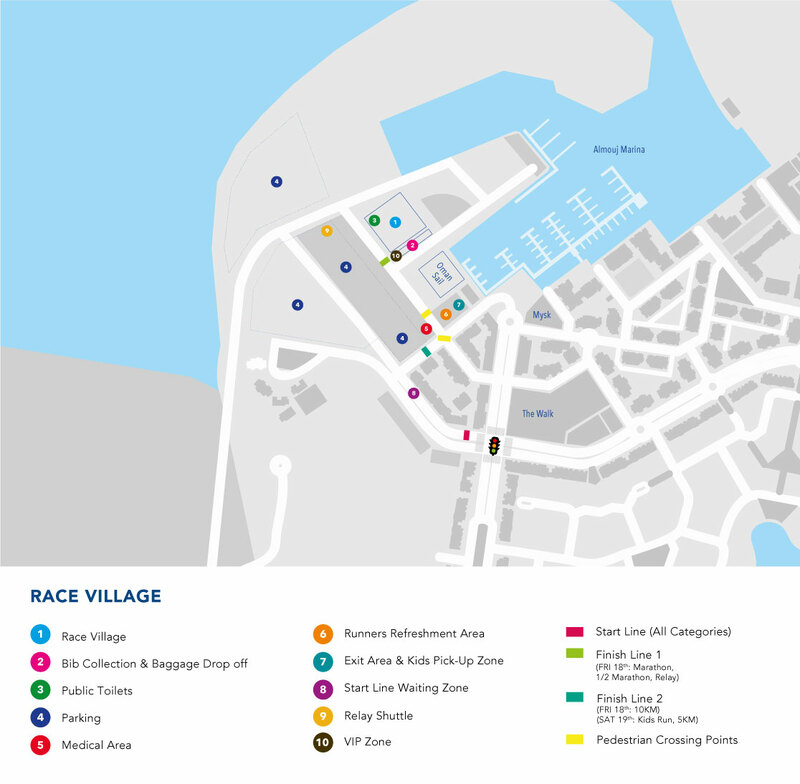 Ranging from an athletes’ recovery zone, to interactive activities and unique shopping experiences, the race village will host local SMEs and international sports brands. For your safety, ease of travel and parking we request and encourage runners, families and spectators to share a car. The below illustration indicates a number of areas, with an indication of their suitability for race distances and opening and closing times. The meeting point for Relay Shuttle Bus is also indicated on the map. The entrance to parking at Al Mouj will close at 6.20am on Friday 18th January, reopening at 12.30pm. Cars will not be able to exit until the course reopens after the event at 12.30pm. Access to the Al Mouj parking area is open throughout the event on Saturday 19th January 2019. Parking outside Al Mouj: There is a 10-15 walk to the event, on pavements only to the START/FINISH.